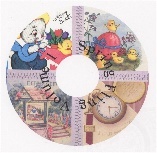 The Spring Fling CD contains Easter, Mother's Day and Father's Day images from many different scrapbooks. There are 117 Easter cards, 119 Mother's Day cards and 20 Father's Day cards. The Easter collection contains a few religious and children cards but most are adult cards. The Mother's Day collection has a couple of unique cards that are addressed to Mother and Father on Mother's Day. It has 256 cards with 280+ images. The cards on this CD date from the 1940s to the 1960s.